As the holidays draw closer, there are more new offers cropping up for lucky players all over the world. Today, we’d like to share with you some excellent promotions and bonus offers from three top online casinos. We’ve got free bonuses, cash back promotions, free spins, and Christmas codes to give you an extra edge on brand new slots. Best of all, these offers are available to players all over the world, including in the USA. 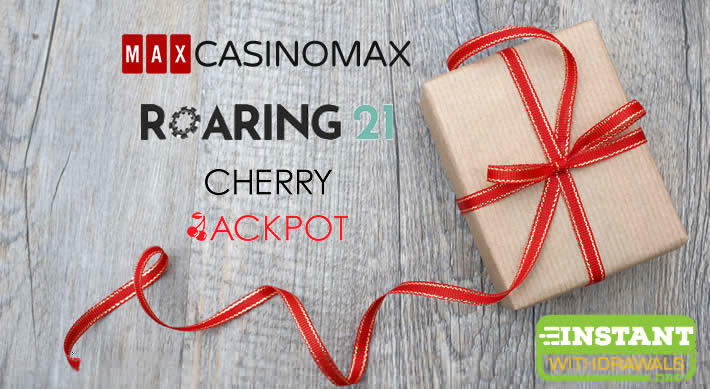 The following offers are available to players at CasinoMax.com, CherryJackpot.com, and Roaring21.com. All three online casinos are USA friendly and offer welcome bonuses ranging from $3,000 up to $20,000. All the excitement begins on Thanksgiving Day, November 22, 2018! All players who make or have made a deposit during November are eligible for a free Thanksgiving gift! All you have to do is contact the casino host team between November 22 and November 30 and tell them what you’re thankful for. It’s as simple as that. Let them know why you’re giving thanks and they’ll thank you right back with a bonus of up to $40. It couldn’t be any easier to put a little extra cash in your pocket to help you take advantage of those crazy black Friday deals. Simple play your favourite games at any of the three casinos from November 23 to November 25 and you’ll be eligible for a minimum of 50% cash back. Deposit $35.00 to $49.99 for 25 free spins. Deposit $50.00 to $74.99 for 50 free spins. Deposit $75.00 to $99.99 for 100 free spins. Deposit $100 or more and receive 150 free spins. The brand new Naughty or Nice III slot will launch on November 21. Players will receive two codes, one for naughty, and one for nice, that can be used to gain special wilds and bonuses on the reels, free spins, and deposit match bonuses, too! Making the deal even sweeter, you don’t need to choose. You can take advantage of both bonus codes! You don’t want to miss this one! Check your email or contact your casino host to get your Naughty or Nice bonus codes. Don’t forget, all three casinos are USA friendly and accept players from all over the world. There are plenty of banking options available to make it easy to get in on the action, too. Players can deposit and withdraw with credit cards, e-wallets, and bitcoin. These offers aren’t going to be up for long, so get in now to get the most out of them. You can take advantage of these special offers — as well as plenty of other regularly running promotions — at CasinoMax, CherryJackpot and Roaring21.